Emergency Services Archives - Oakwood Construction & Restoration Services, Inc.Oakwood Construction & Restoration Services, Inc.
Few things are as terrifying as a house fire and the resulting fire damage. Not only are your most precious possessions in danger, but your very life and that of your loved ones can be at risk. 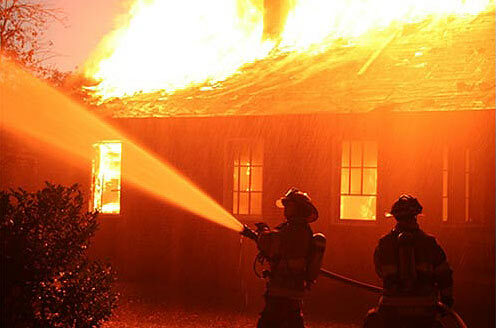 Even the effect of a smaller house fire can be devastating, as your family suddenly may have to find temporary lodging, protect the house from the elements and vandals, rescue possessions, and then finally see about having the damage repaired. Many big decisions will have to be made quickly, often at a time of profound emotional shock when it’s hard to think clearly. If you’ve just had the unfortunate experience of a house fire in California, at this point you want to know how best to deal with the fire damage. While the exact way to tackle the problem will vary, depending on the type and extent of the damage, there is one thing that doesn’t change. One of the first things you should do is call both your insurance company and a fire damage restoration specialist. An Oakwood Team fire specialist will first take care of emergency repairs and precautions. If the fire was relatively minor, he will cover holes in roofs, board up wall openings, and pick up carpets so that soot won’t be ground further into them. He can quickly arrange for moving out possessions if necessary – for their protection, cleaning and restoration, and to facilitate structural repairs to the home. A qualified fire restoration specialist will then turn his attention to assessing the structural damage to the home. After a careful inspection, he will come up with an estimate of the cost of a full restoration. Though your insurance adjuster will be doing the same thing at this time, you should have a qualified specialist do it in parallel. It’s often hard to determine the full extent of fire damage until the repairs actually have commenced, and a second opinion will help protect you from an insufficient settlement. Sometimes damages prove to be worse than originally thought, and having a second estimate performed immediately after the fire can lay a basis for justifying extra costs. Because of his depth of experience in fire restorations, the restoration specialist will know how to coordinate your job to get it done as quickly and expertly as possible. If structural damage is major, he will bring in an engineer to detail repairs and draw up necessary plans for a Building Department work permit. He can bring in electricians, plumbers and painters as needed. And if any belongings require more than cleaning, he can arrange the contents division to restore furniture and special possessions such as artwork and books. If the damage inspection determines that your house is unable to be repaired and must be demolished, your restoration specialist can take care of that sad task as well. But on a happier note, homeowners sometimes actually take advantage of fire damage and have major remodeling done. Since you need to rebuild part of your home anyway, this could be an ideal time for a long-desired addition, kitchen makeover or other project. Why not rebuild the way you really want? Your restoration specialist will be flexible enough to help you do just that. Recovering from a house fire is a major endeavor. It will take time, effort, and many decisions before your house is the way it once was again, or better. You owe it to yourself to have an experienced damage repair professional working for you during this difficult time.